Thank you Stav! Complete set of the 'National Heritage' issue. Issued in a sheet of 10, only 5 have tabs. Top left is the Peki'in Synagogue, which, in its construction re-used 2nd-3rd cent. stones, one of which had a menorah carved on it, as shown at top left. The stamp at top left shows a 5th cent. synagogue in Ein Keshatot, a town razed in the 8th cent by an earthquake. Today, the site is being restored under Heritage Project funding. At top right is the bulla/seal of Gemaryahu ben Shaphan with the City of David in the background. Issued: February 11 2014. 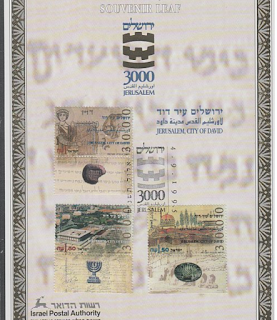 Philatelic exhibition card from 'Jerusalem 3,000 Years'. The top stamp has the same seal that is on the above 'National Heritage' issue. This card is still available on buckacover here, just search 'Israel1995'. As you said, It's a Complete set of the 2014. The stamps look good to me. Glad to see the stamps.